You might have few types of projects that have their own structure, however, the same type of projects always have the same set of tasks and phases. 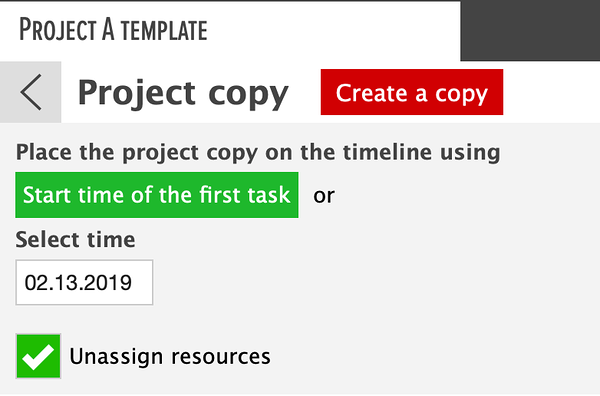 To manage this easily you can create a template project of the tasks you use for each of the projects (with or without resources), and save it. You can either create a template from an existing project or from scratch. The first might be easier to get started because you don’t have to think about hypothetical dates for milestones. All the templates you have created appear under templates tag in the list of projects. All the aspects of the template can be changed when opening the template and when creating a project using it (including milestones, colors, etc). However, if you do happen to make all the changes to your template instead of a project, you can create a project from the template and all your hard work won’t be for anything. You can access it via the PROJECTS icon on the left sidebar. This will open the list of Project Templates. This will open the Template dialog. The Project Template has been created. You can see it in the list of Templates section. You can do so by clicking on the grey window icon. This will open the dialog. The default date is based on the first task of the Template. You can change that manually. Select 'Unassign resources' to detach Resources from the Tasks. This will result in placing the Tasks to the 'Unassigned' section. You can access them via PROJECTS icon on the left sidebar. You can find it on the upper left. Inactive Project Template tabs will be displayed in grey – this is how you can differentiate it from your projects. If you are using grey as a project color, be careful here.